GOOD OLD DAYS: The Blank Club remembers the San Jose club. IN the late '80s, downtown San Jose was going through massive redevelopment, with seemingly endless construction everywhere. At the same time, a thriving counterculture scene grew organically on a stretch of First Street that wasn't part of all the redevelopment. A nightclub called F/X opened at the corner of First Street and San Salvador in the old Pussycat Theatre, providing a creative antidote to the meat-market bars that constituted what little nightlife existed in other parts of downtown. At F/X, variety was crucial. You'd see national touring bands, B-movies, British motorcycle events, fetish dancing, oddball costume contests or even Twin Peaks episodes in the afternoon—basically anything for creative types and grandiose individualists who couldn't bear the mainstream clubs. 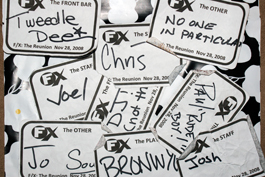 F/X existed from 1989 to 1995, but in 2008, a spirited reunion took place at the Blank Club the day after Thanksgiving. Organized almost entirely on Facebook, the reunion brought together former staff and regulars from far and wide. Everyone congregated for a DJ-fueled soiree highlighted by heavy boozing, boogieing and fuzzy recollections from the old days. It was like a high school reunion, except everyone actually wanted to see each other. This year, another reunion takes place, again, on the day after Thanksgiving. DJs Spun, Chainsaw, King Raffi, Harry Who, Julius Papp, Brian Raffi and Rick Preston will dig deep into their collection for all your favorite modern rock, funk/soul and house jams, circa 1989–1995.